These are Flip Pins, advertised new IC style pins for PCB projects. 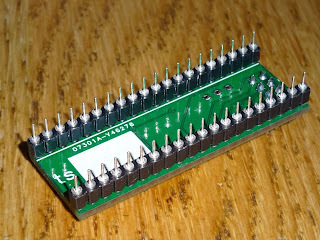 They come in 20 pin, 14 pin and 8 pin versions (for 40, 28 and 16 pin sockets). 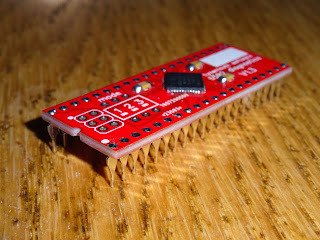 The idea is they can be soldered to a PCB to form a unit which can plug into an IC socket. When I saw these, I ordered a few sets to try them out. There are many options already available. The easiest and by far the worst is to use square pin 0.1" header, designed for connectors or jumpers. 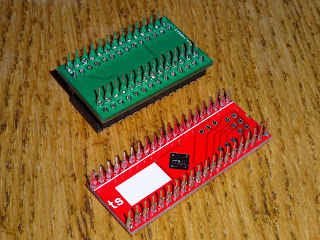 These won't fit turned pin sockets, and will damage single or dual wipe standard IC sockets or breadboards. 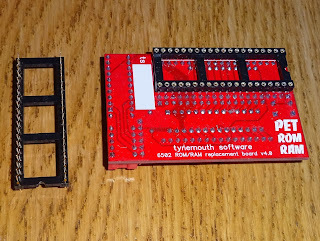 These were some QFP adapter boards which came with pins attached. I wouldn't recommend using these type of pins. 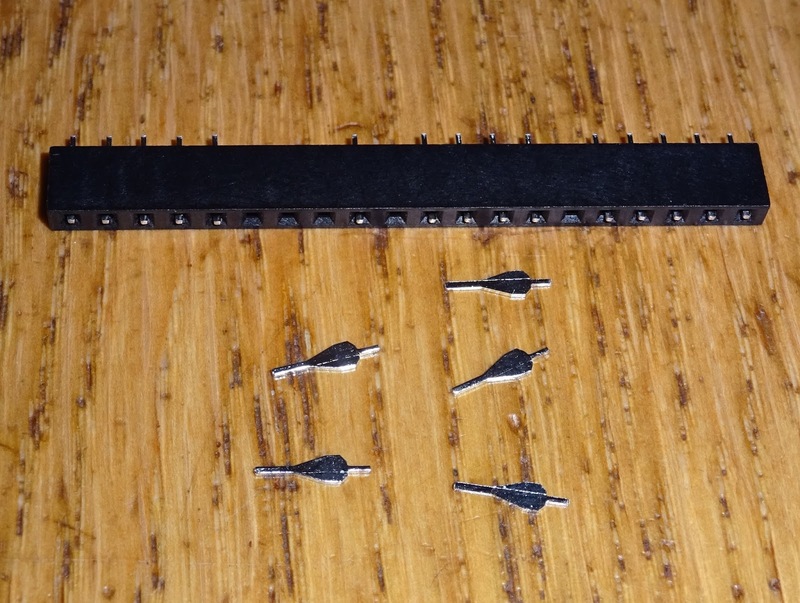 You can get single inline pin strips with pins on both sides, I used to use these on the dual SID boards and various IC adapters. 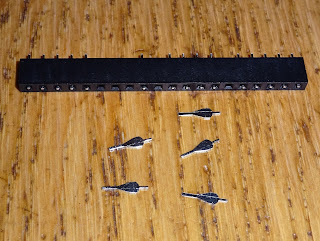 They can be a little fragile and if a pins snaps, the whole row has to be replaced. Recently, I have been using these IC sockets with pins on both sides. 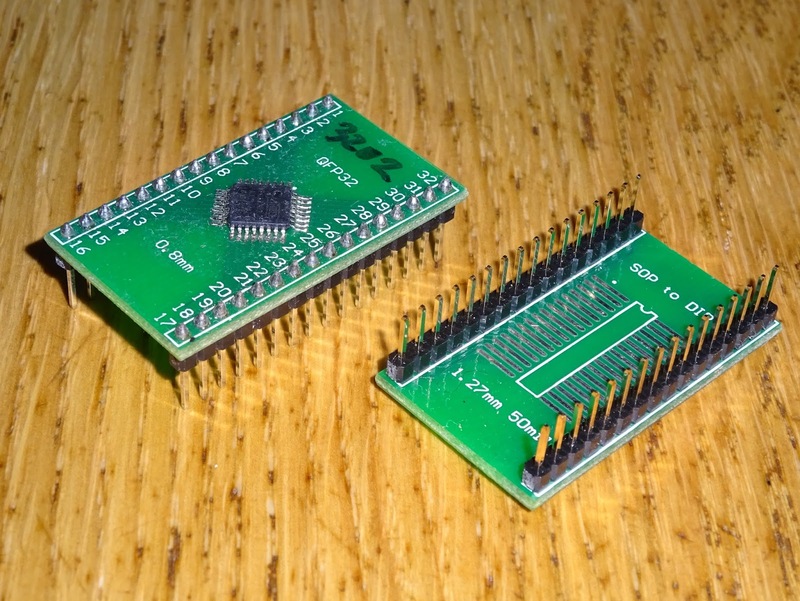 This means I can solder these directly to a PCB to leave pins sticking out the bottom of the PCB. 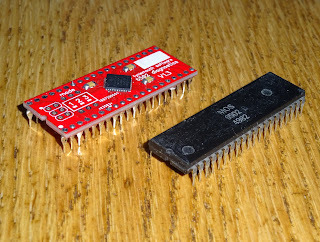 I also use these with a socket IC soldered onto the bottom of the PCB, and plug the double sided socket into that. 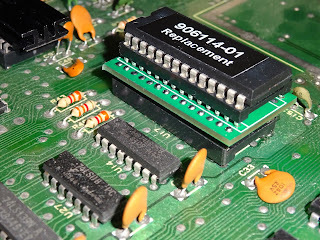 This raises the plug in board higher, which is often useful for something like the PET ROM/RAM boards which need to overhang adjacent chips which may also be in sockets. 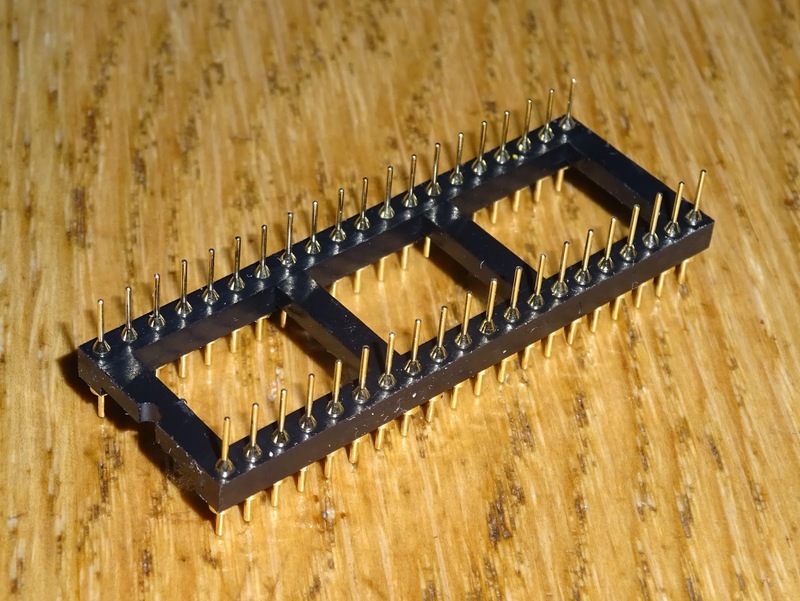 The idea with the flip pins is they have a flat profile, like an IC, rather than round like the SIL/DIL pins or square like the header pins. This should mean they can be used in any sockets. 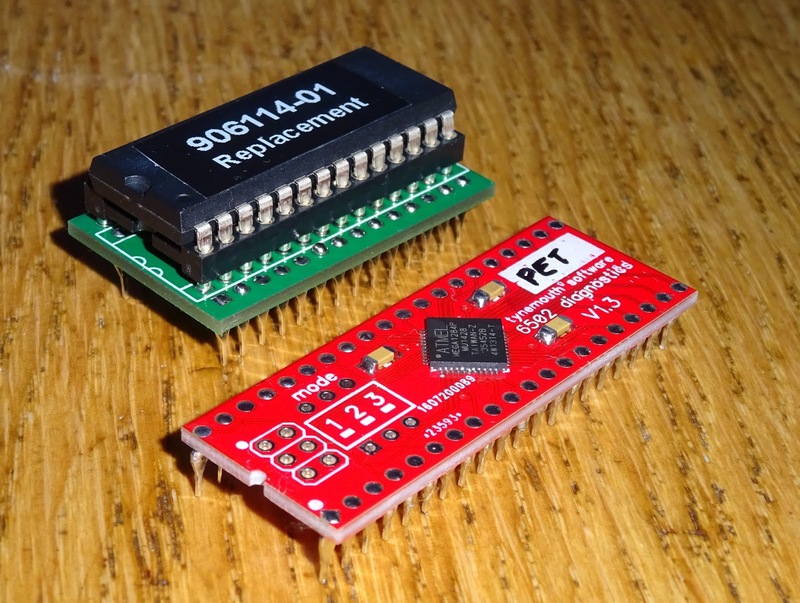 The obvious project to test these with was the PET diagnostic boards, which are designed to plug into the 6502 socket of a Commodore PET. 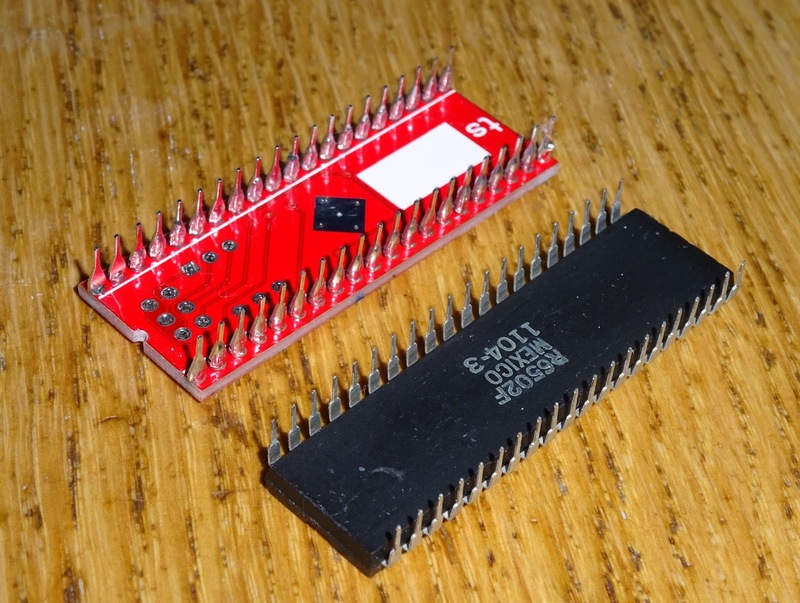 These now form something which looks even more like the IC it replaces. 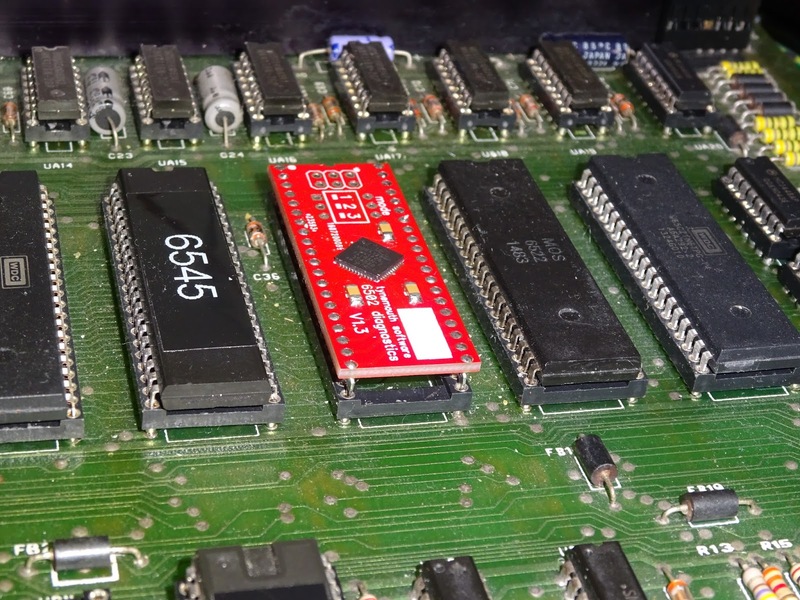 The pins arrive in a carrier, which holds them in place whilst you solder, and then is removed to reveal the pins. I ended up making a jig to hold both sides level. Would be nice if they came in a 0.6" wide carrier with pins on both sides like a 40 pin socket, so both sides would be correctly spaced and aligned. I found during assembly that the pins do not stick up through the holes on the PCB enough to solder them properly. You can't get to the pin itself to heat it with the tip of the soldering iron, so you are relying on heating the pad and letting the solder flow around the pin and hope it takes. 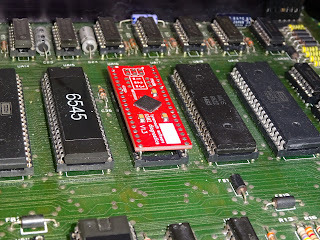 I would prefer if they stood at few millimetres above the PCB so they could be properly soldered. 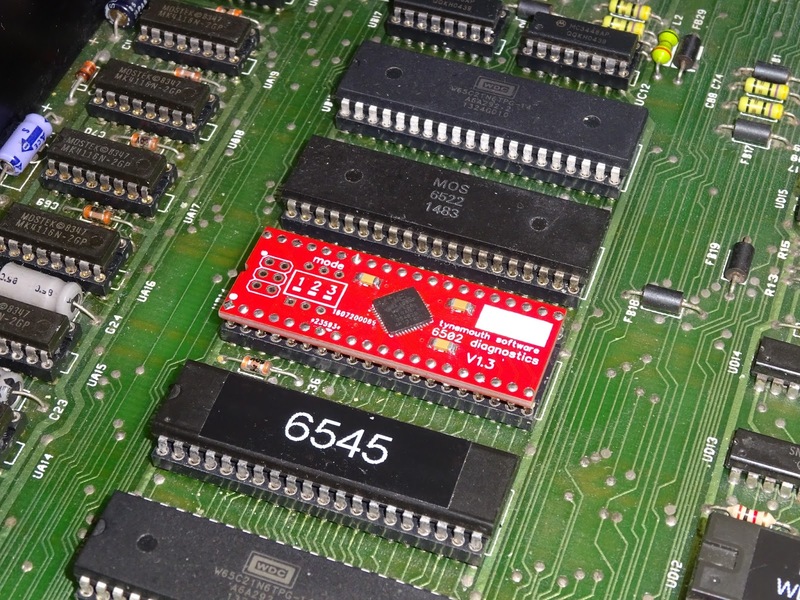 The completed units can be produced to be no larger than an original IC, so would be ideal for IC replacements. I've built up a few boards to try this out. 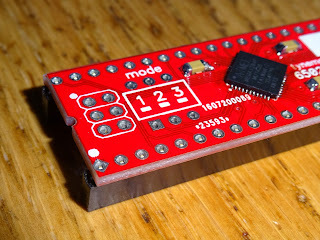 I think this main issue for me is not being able to solder the pins properly, so they aren't are firmly attached as I would like. Don't even think about trying to rework them once the carrier has been removed as they will rotate or fall out and you will spend the ages trying to get them back in line (see if you can spot which of the previous photos was taken after I had tried to tidy up a PET diagnostics board and made it far worse). 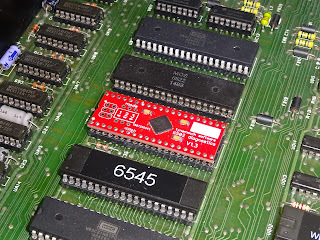 You can see how flat the solder joints are on the top of the PCB, there is no protruding pin. I can see that might be an advantage in some situations, but maybe they could offer two versions, one with longer pins that can be soldered normally. I don't think I will be using them, I would like to, it's a great idea but I don't think in the current format, they are strong enough. They do work, and may be suitable for other projects. 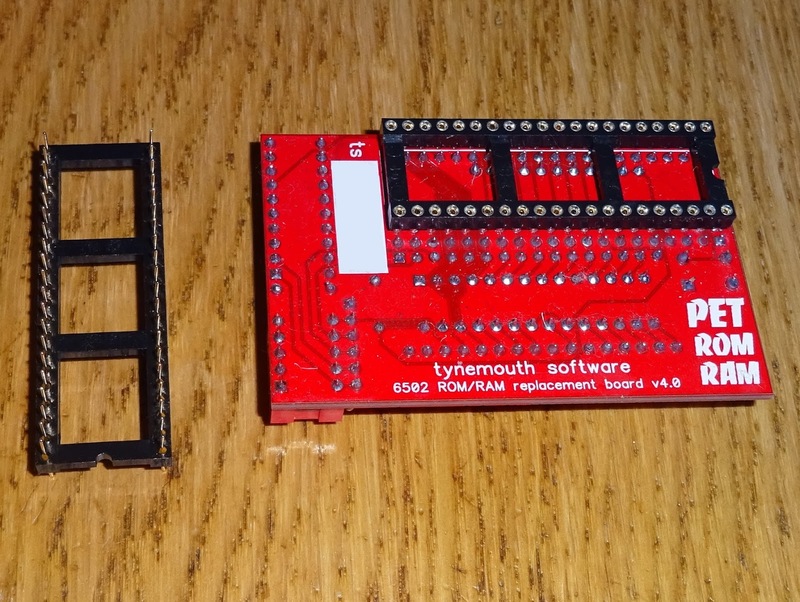 I'll be keeping a look out for a version with longer pins or a dual carrier.